With Qt Creator, navigating to different locations in your project or on your disk, e.g., files, classes, methods, etc., is trivial using Locator -- a smart line edit at the bottom left of Qt Creator's window. Suppose you would like to open your project's main.cpp file, click on Locator or use Ctrl+K, type in the file name and then press Return. The file will be opened in the editor. You can also type part of a file name and use the wildcard characters * and ? to match any number of any characters. A list of all files matching your criteria will be displayed. Some of these filters require you to activate them by typing an assigned prefix. This prefix is usually a single character followed by Space. For example, to jump to the definition of the class QDataStream, type: Ctrl+K to activate Locator. 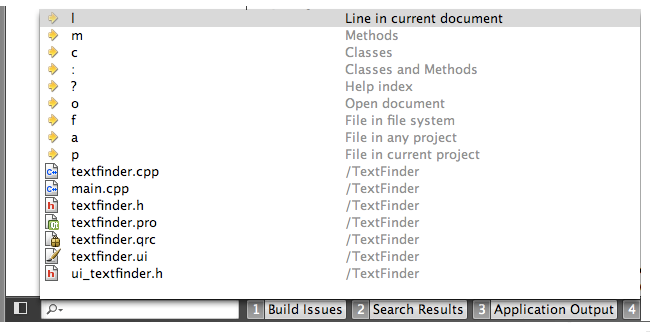 Then type colon (:) followed by Space and the class name. and choose Configure... from the menu displayed. This displays the Preferences dialog (Options on Mac Os X) for navigation filters. Click Add to create a new filter. 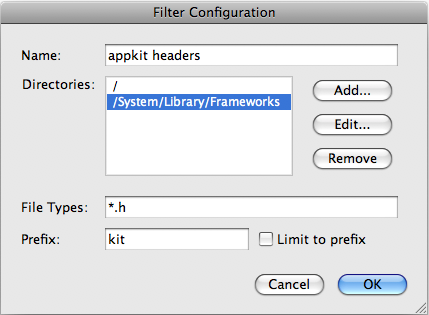 In the Filter Configuration dialog below, give your filter a name, select your preferred directories, set file patterns with a comma separated list, and specify a prefix string. After closing this dialog, Locator will search the directories you selected for files matching your file patterns, and the information will be cached. Click Refresh from the menu above to update the cached information. Go to an opened document Ctrl+K, o, Space, and the document name. Go to a file in the file system (browse the file system) Ctrl+K, f, Space, and the file name. 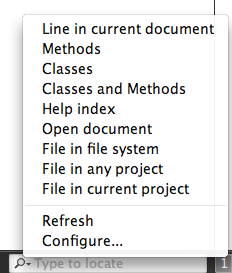 Go to a file in any project currently loaded Ctrl+K, a, Space, and the function name. Go to a file in the current project Ctrl+K, p, Space, and the function name. Go to a class definition Ctrl+K, c, Space, and the class name. Go to a method definition Ctrl+K, m, Space, and the class name. Note: By default, if you press Ctrl+K and do not use a prefix to specify a filter, three filters will be enabled: o, l, and a.